A superior hypogastric plexus block is a procedure in which sympathetic nerves are blocked in order to relieve pelvic pain and in some cases, tailbone pain. Sympathetic nerves originate along the spinal column and extend to all smooth muscles and glands within the body, including the muscles of the heart. These nerves send and receive signals throughout the body, enable and control involuntary movements, and govern how the body reacts to unexpected physical changes or external (e.g., environmental) changes. Patients with pelvic discomfort are often treated with pain-relieving medication or injections, but sometimes this treatment does not improve symptoms and in some cases, can cause intolerable side effects. When this occurs, a superior hypogastric plexus block may be recommended. Blocking sympathetic nerves in specific regions has been shown to treat various types of pain including head, neck, and back pain, as well as pain in the upper limbs. The superior hypogastric plexus block, however, is utilized to specifically treat pelvic pain. The superior hypogastric plexus is a structure that is located in the abdominal region and encompasses nerves that extend into the pelvis and tailbone. Therefore, blocking nerves in this region leads to the reduction of pelvic pain. The superior hypogastric plexus block procedure involves the insertion of a needle and catheter that is placed through the needle. After correct placement has been confirmed, through the use of contrast agents and imaging equipment, an anesthetic or an agent that disintegrates nerve tissue is administered to alleviate pain. Radioablation, which entails using a needle and an electrode that creates a high level of heat in order to remove nerve tissue, may also be utilized in place of chemical agents as this has been shown to produce longer-lasting results. The block can be performed with the use of computed tomography (CT imaging), but this method requires extensive amounts of time and equipment and exposes the surgeon and patient to significant levels of radiation. 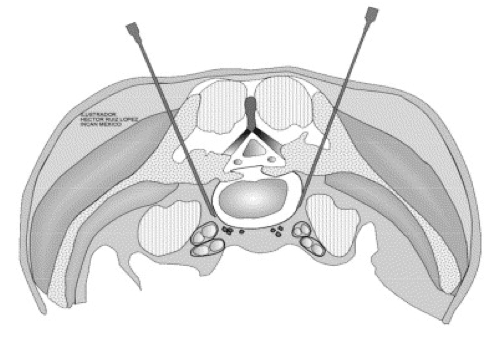 A transdiscal approach, which involves inserting the needle through spinal discs in order to reach the superior hypogastric plexus, can also be used, but this method has serious risks such as possible disc infection or rupture. An anterior approach where the patient is laying on the back can also be performed for patients who cannot lay face down or have spinal abnormalities that would cause complications if the procedure was conducted posteriorly or transdiscally. The traditional method is still most commonly performed, involving the use of fluoroscopy to guide the insertion of the needle and catheter through the posterior region near the buttocks, directly below the spine. Fluoroscopy exposes both the surgeon and patient to less radiation. When used to treat pelvic pain that is the result of cancer or radiation injury to nerves, this procedure significantly reduces pain as well as the need to use pain-relievers, such as morphine, while increasing mobility and overall well-being. In some cases, where patients have been treated due to radiation therapy complications, symptoms are typically still absent when a two year follow-up examination is conducted. Chronic pelvic pain that is the result of conditions that originate in the genitalia, such as endometriosis in women or refractory penile pain in men, is often successfully relieved through the use of a superior hypogastric plexus block. In addition, patients who may have previously needed to take pain-relievers or even antidepressants may no longer need these medications or may be able to significantly decrease their dosage. 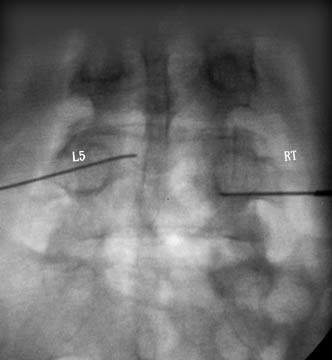 Pain relief after the superior hypogastric plexus block has been performed is typically rapid, with patients reporting significant improvements within the first 24 hours, and the effects are generally long-term. Currently, this is an optimal form of treatment for chronic pelvic pain. Superior hypogastric plexus block is a minimally invasive procedure in which sympathetic nerves are blocked through the administration of anesthetics or agents that disintegrate nerve tissue in order to relieve pelvic pain. The superior hypogastric plexus is located in the abdominal region and contains nerves that extend into the pelvis, therefore, blocking nerves in this region leads to the reduction of pelvic pain. The risks associated with this procedure are minimal and are most related to the position of certain nerve roots, arteries, and veins. In addition, some patients may have spinal abnormalities (e.g., spinal elongation) that may make it harder to properly place the needle. However, imaging techniques are used in order to guide the insertion of the needle. The posterior approach is the most commonly used procedure. 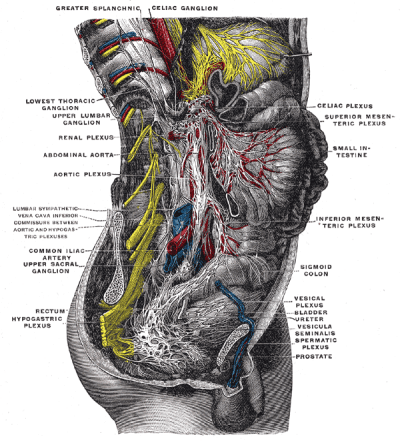 The superior hypogastric plexus block is used to treat pelvic pain that is the result of various conditions that may originate in the reproductive organs and genitalia, different types of genitourinary and gynecologic cancers (e.g cervical, prostate, testicular, or ovarian cancer), or radiation injuries to muscles and nerves. The procedure is generally performed if treatment with medication has been ineffective or causes intolerable side effects. It has proven to be effective in relieving chronic pain in many patients. In some cases, pain has not returned for up to two years following treatment and many patients can either stop taking pain medication or take significantly lower doses.